On our way to Iran, while in south-eastern Turkey, we had to make a decision. What is the route we take to Iran? 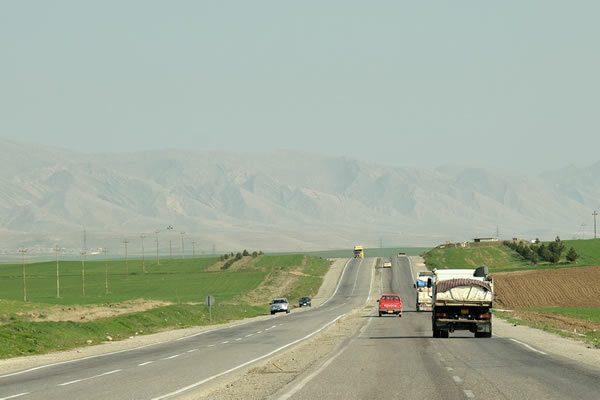 The most obvious route is the Turkish-Iranian border post at the village of Esendere, in the extreme south-eastern corner of this vast country. This route is nowadays a popular route for many travellers as it goes through a beautiful mountainous area. And that was our problem. It is winter and the mountainous south-eastern part of Turkey is known for its harsh winters. In addition, snow can come down unexpectedly and can block the border for days. So, we were not keen to choose for this uncertain option. The other option to travel to Iran is via Iraq. 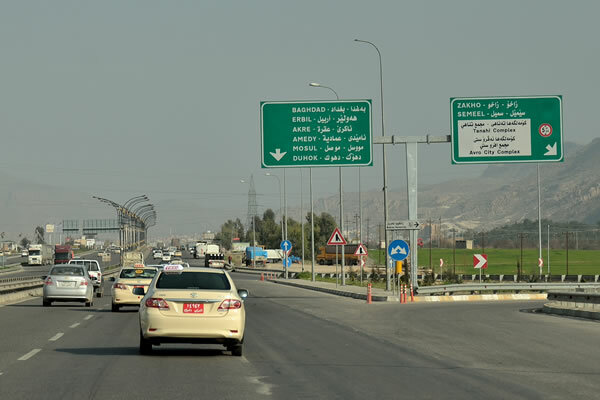 The route takes you through the northern Iraqi cities of Erbil and Sulaymaniyah. However, the Iraq route has a major drawback: it goes through Iraq. The country is torn apart by violence and conflicts, and dozens of people are killed in attacks on a daily basis. It is still a war zone. This is the image of Iraq that we all know because we see the misery almost daily in the news. However, Iraq also has a very different face, A face of peace, natural beauty and an extreme form of hospitality. And that part can be found in the northern part of the country, also known as Kurdish Iraq (local people like call the area ‘Kurdistan’). The Kurdish part of Iraq is the "other" Iraq and is in our opinion the newest travel destination in the Middle East. Kurdish Iraq is technically part of the greater Iraq, but has a far-reaching form of autonomy, making it feel as if it is a separate country. It has its own flag, its own president, its own parliament, its own stamps, an army and police force, and even the immigration stamp that you get in your passport, does not tell you that you have entered Iraq. After having done thorough research on the internet, we were convinced that the area is safe, and decided to take the Iraq route. We spent the last night in Turkey in the town of Midyat, far away from the Syrian border. It is also possible to stay closer to the Iraqi border (in Cizre or Silopi), but these places are very close to Syria. Too close for us. 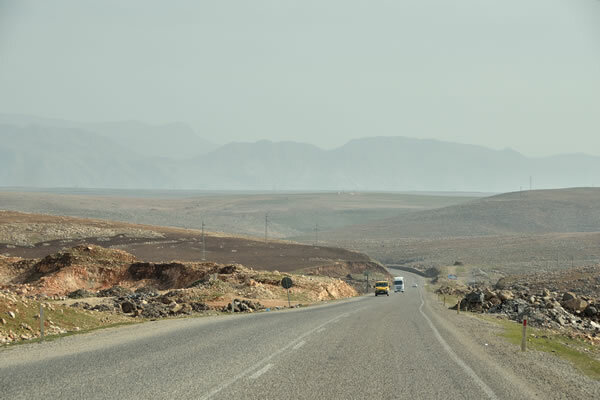 Early in the morning we drove the 140 kilometres from Midyat to the border with Iraq, called the Ibrahim Khalil border crossing. The ride went well and in Cizre (still in Turkey), we filled up our diesel tank one more time because we had heard that, although the Iraqi diesel is cheap, the quality isn’t that good. 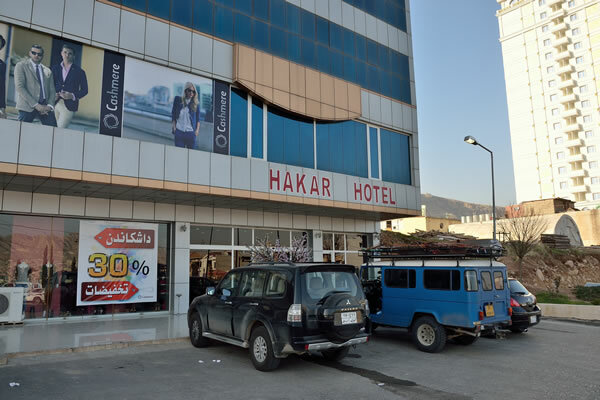 The pump attendants invited us for a cup of tea, but we declined this Turkish hospitality. We did not know how long the procedures would take at the border, so didn’t want to 'waste' any time, also because we would lose one hour due to the time difference between Turkey and Iraq. 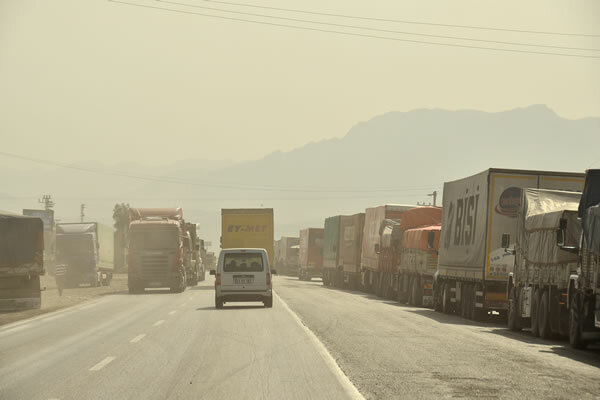 Already sixteen kilometres before the border, a long double queue of dusty trucks were waiting for the border crossing. 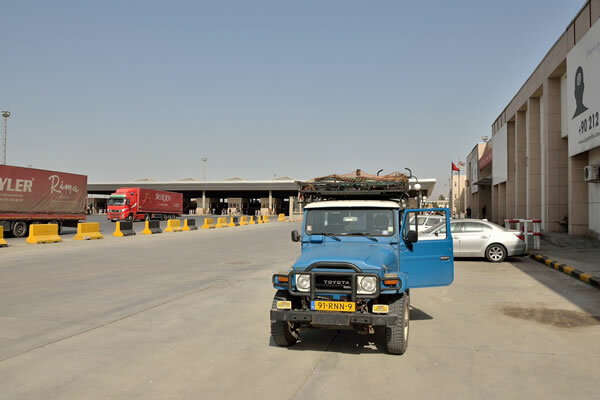 Later we learned that the average waiting time for a truck at this border crossing is three days! 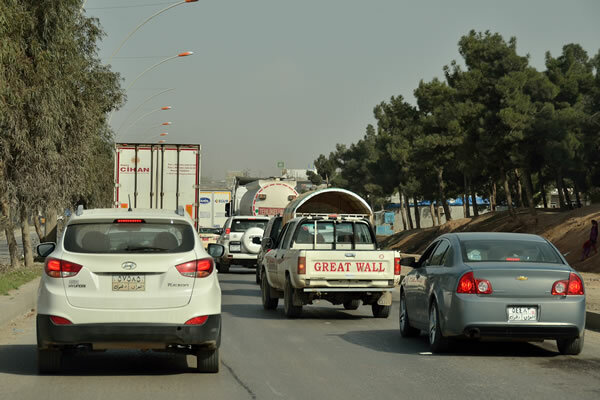 We took the left lane to pass the queue of trucks and drove against the traffic, to cover the last sixteen kilometres to the border. Like most border crossing areas in the region, also this one is a little bit seedy. The wind caused a lot of dust, rusty truck carcasses were everywhere and truckers waiting for the border had no place to leave their garbage than on the street. When we arrived at the border, there appeared to be no queue for the cars. A few sleazy young guys hang around trying to entice us to hire them "to run the procedures smoothly”. We did not, and it is certainly not necessary, because the Turkish official immediately stamped us out of the country. Then it's a few hundred meters to the Iraqi border. The immigration process was miraculously fast. We were asked to enter an office where some men were sitting behind a desk to stamp the passports of visitors. Welcome to Kurdistan! We got back in the car and drove a hundred yards to the customs. After hearing a few more times “welcome in Kurdistan" and shaking many hands, a few officials started inspecting our jeep. On a pink paper all the features of the car were recorded, such as brand, model, engine size, vehicle identification number, etc. Afterwards we were requested to take the pink paper to the 'salon'. The ‘salon’? After asking at several places, we eventually found the ‘salon’ office. To our great surprise we were welcomed again with the words 'welcome in Kurdistan’; but this time in the Dutch language! A young man (Salem) behind the counter has lived in the Netherlands for nine years and spoke fluently Dutch. And that seemed to be our good fortune. The fact is, that when you enter the country with a car, you need to leave the car documents or a 1500 Euros/Dollars deposit, at the border. You will get it back if you take the car out of the country at the same border crossing. But that was not an option for us, because we were on our way to Iran, and did not want to go back to Turkey through this border crossing. Salem has helped us enormously by getting permission that we could take out the car at another border crossing. The whole process took two-and-a-half hours and included a visit to the big border boss, who had to give approval personally. They prepared a special letter for us, that we have to show at the border with Iran when we leave the country. Salem even gave his mobile number told us that we could call him any time if we have any questions or problems. "Welcome again in Kurdistan" is what he said again when we said goodbye to him. And as with all Kurds who we have met to date, it came straight from his heart. This is a fabulous, welcoming and safe area in a further torn Iraq.